Yes, it’s true: a rather not-so-tiny near-Earth asteroid SKULL-SHAPED ZOMBIE COMET (see below) 2015 TB145 will make a relatively close pass by our dear planet Earth on October 31, aka Halloween — the day when certain beliefs profess that the veil separating the worlds of the living and the dead is at its thinnest, allowing spiritual and even physical interaction to occur between both. If you’re thinking that seems like a big size range for an object like this to “possibly” be, there’s a reason (and thus the cautionary tale) — 2015 TB145 was just discovered this month. The NEO 2015 TB145 was identified on Oct. 10, 2015 via the PanSTARRS I (Panoramic Survey Telescope & Rapid Response System) survey telescope, located atop Mount Haleakala in Hawaii. The goal of PanSTARRS is specifically to locate objects like this, so it accomplished exactly what it should. But it also reminds us that there are still as-yet undiscovered objects out there orbiting the Sun in the vicinity of our planet, and it’s important that we maintain vigilance and continue supporting global efforts to find and study them. As it passes Earth 2015 TB145 will be observed with some of the best radar telescopes on the planet — NASA’s DSS-13 at Goldstone, California and NRAO’s Green Bank Telescope in West Virginia (and possibly also with the Arecibo Observatory in Puerto Rico.) Because TB145 is so dark (absolute magnitude currently listed as 19.8) optical observations won’t reveal much, but radar can help scientists “see” the asteroid and determine its size, shape, and rotation and better plot out its orbital trajectory into the future…especially where it concerns its encounters with our planet. NASA won’t be the only ones watching this object’s pass either — plenty of amateur astronomers around the world will have their ‘scopes set on 2015 TB145’s path, especially in the Middle East where it will still be dark during its closest approach. Find out how to view TB145 here, and you can watch a live broadcast of the viewing on the Slooh site here starting at 12:30 p.m. ET (16:30 UTC) on Oct. 31. And, based on TB145’s orbit and high velocity, it’s suspected that it might even actually be a comet. So while NASA isn’t spooked by 2015 TB145 (and you shouldn’t be either) we should all still be aware that we’re certainly not the only ones traveling on this road around the Sun… there’s always the chance of running into the occasional traffic. It’s important that we spot them — especially the big ones — first. 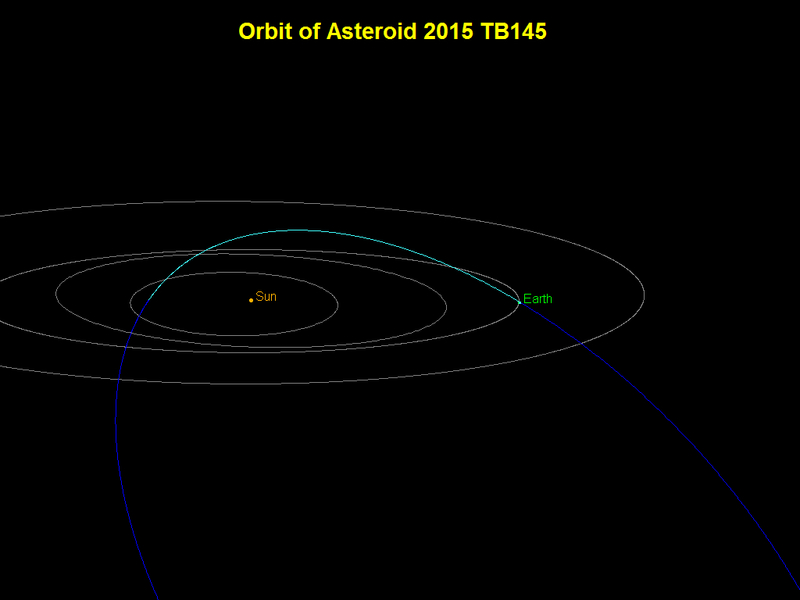 See more information on 2015 TB145 on JPL’s NEO site here. *2015 TB145 will also pass closely by our Moon, coming within about two-thirds that distance two and a half hours prior. UPDATE 10/30: radar observations from the Arecibo Observatory have been used to create an image of the quite-dark 2015 TB145 and, if it wasn’t spooky enough that the asteroid is passing on Halloween, it even bears an uncanny resemblance to a giant skull and it might really be a comet — a dead one. Read more here. UPDATE 12/14: Research by the Planetary Science Institute’s Vishnu Reddy on the spectra from TB145 has shown that it is very likely a dead comet, as initially suggested. Read more here. Just for fun (whee!) I ran some of the known values for 2015 TB145 through an online impact calculator developed by Dr. Andrew Scott at the University of South Wales. Assuming that TB145 is composed of mainly porous rock (if it’s a comet it could even be less dense; if a stony/iron asteroid more) then a totally direct strike on Earth at a 90º angle in, say, New York City would leave a crater 9,767 feet (2,977 meters) wide and 2,080 feet (634 m) deep — bigger than Barringer Crater in Flagstaff, AZ. Luckily impacts of this magnitude are 1-in-75,000-plus year events (and don’t specifically target major cities!) But needless to say it would be a very bad day in the Big Apple. Kind of scary that we only identified this a few weeks ago. It serves the creepy fact that our solar system, let alone the whole universe, is so freaking vast, with so many objects swirling around, making it very hard for “us” to identify them. What would happen if we found that this object was heading straight towards us? Do we have a plan for that? Sadly, no. Al of our “plans” are on paper only. So we would be screwed if anything like that was discovered? That can’t be right. It shouldn’t be true but it is. Luckily the chances of a direct hit at any particular moment are very slim. But still, if it occurs, we’re utterly unable to do anything about it and it would threaten our existence, if not eliminate us entirely. To put it in perspective, the rate of impacts on Earth by objects the size of TB145 are about 1 in every 75,000-100,000 years. So very low. But you definitely wouldn’t want to be in the area on the particular day one *does* hit. Something this size and speed wouldn’t wipe us out by any means, but it would do severe damage to a populated area or city. 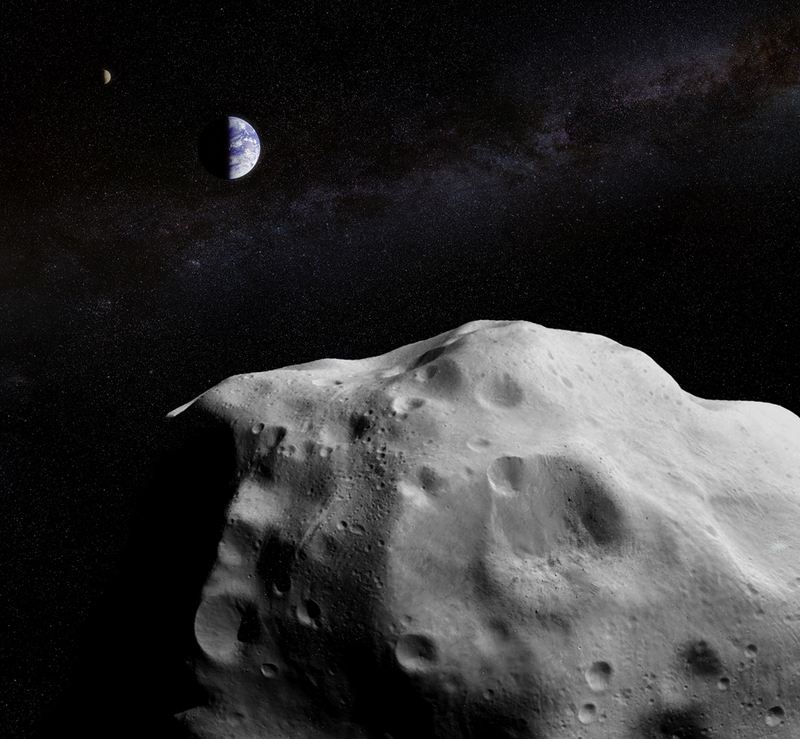 An asteroid the size of California would be game over for life on Earth. It’s not too late to get an Asteroid costume with overnight shipping. Does anyone else think it’s only a big deal because it’s on Halloween. If it was any other day then it would probably never make the news. It’s actually significant because 1. it’s pretty big; 2. it’s moving very fast; and 3. it’s coming quite close compared to other objects. If it turns out to be a comet that will be very interesting too. NASA will be aiming the radar dishes at it. The Halloween part is just an added bonus for the media. When I read this, I felt much like I do when I watch NGT on Cosmos (or just about anything, really) – very small, but filled with a very big awe. The universe is pretty darn marvelous. it makes me think like that too, and then you look at everyone and everything that goes on here, all the crime, and everything and makes you realize how self centered everyone is. We are a tiny little planet, in a really big and hostile universe, and here on our tiny spec of a planet, everyone is trying to tear one another a part for power or money. Crazy. How does this one compare to the big hit that happened over Siberia early in the 20th Century? That was a nasty smack. Would TB145 be bigger, lesser, or about the same? The effect of impacts has a lot to do with the angle the objects arrive at and their composition, as well as relative velocity…. but we could at least say that TB145 is over 8 times the size and traveling twice the speed of the 1908 Tunguska impactor. Thanks for the comparison. The physics involved quickly rises above my pay-grade. You suppose the dinosaurs thought it wasn’t a big deal too? definitely, but the probably just never had a plan written on paper for this either. I’m sure they thought it was a very big deal for a very, very short period of time. There’s a good chance it was a combination of both that changed global climate enough to halt the success of large dinosaur species. So freaky! What if its heading straighr for us?!? Luckily for us it will miss by a considerable distance — Earth and TB145 will not be sharing the same space on Oct. 31. Well, should the biggy decide to visit us someday, I dont want to know. Nice stats you punched in. I’m a huge science geek I love this stuff. So THIS is where the alien vampires will come from! Follow me I’m new on WordPress I’m active liker. Those were great writing. it gave me much pleasure. I am a freshman in the enoromous wordpress world. I just started blogging few days ago. As you all know, every freshman need a positive feedback from the superfast bloggers. So I’m expecting a very worm welcome from you. You can visit my Blog so that I can share my Feelings to you and you can have many INTERESTING NEWS . looking for a positive feedback https://domaincombd.wordpress.com/ Thank you. Have a nice day. Fascinating…. 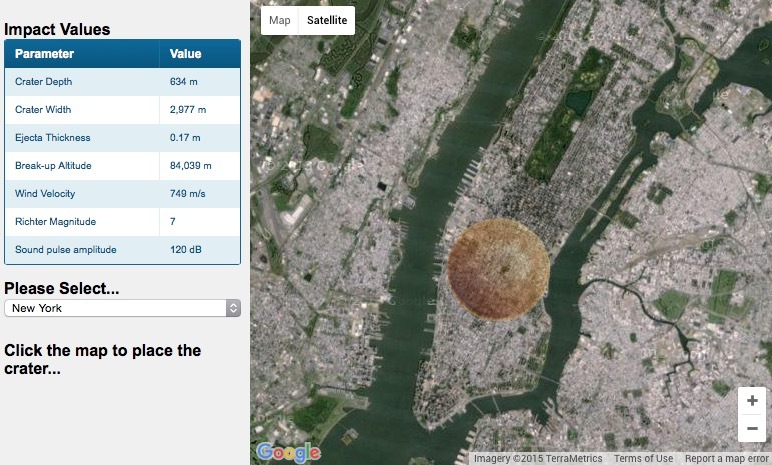 love the image of the big blot on the landscape, should Armageddon happen in NYC. Thank you, your article was very interesting and insightful! When I imagine the strength of the nature here on Earth, I can’t even begin to grasp the power and energy these space objects have. Such a shame that it is not a big bigger so that I could observe it with a lower quality telescope. Hypothetically-if the asteroid was to hit the earth; the world would be working together to destroy the asteroid, one thing all countries are skill at is destroying objects. 150MILLION KILOMETERS OF LIGHT SOLAR? Thank you Jason, this was very enjoyable to read- and insightful on the maths at the same time! Very succinctly and humanly put- unlike the monotonous labour of reading scientific reports -winks- a very entertaining feature! How will they determine if it is a comet? If it forms a tail as it approaches the sun? Thank you for such an informative and well-written piece, though scientificaly thick as I am, I won’t be able to recount the details after a few days! Reblogged this on A MERE JOURNEY FROM LOCAL 2 GLOBAL. 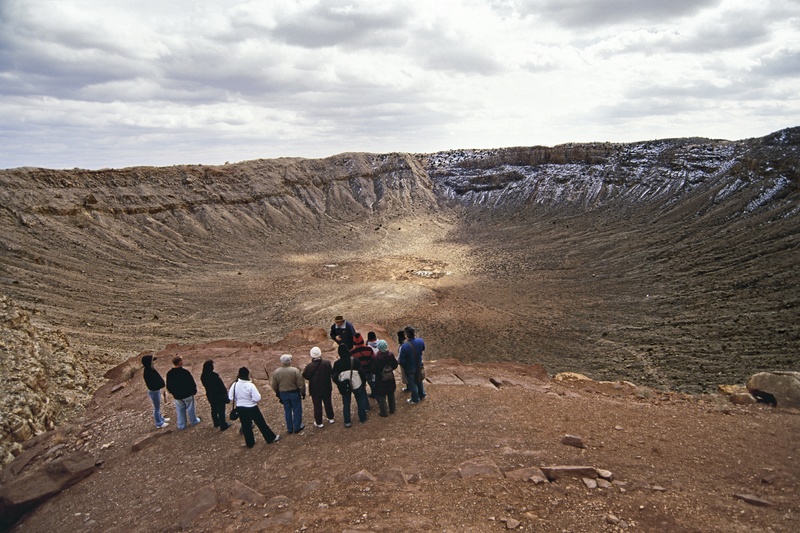 And recall that a collission with a massive object has happened one time in more than one billion years. And this object was the predicate cause of mammals evolving and flourishing and becoming all kinds of weird stuff including homo sapiens sapiens. Whose name calls them “smart smart,” though some of us fear rocks from space when anything big enough to worry about would have to be mostly ice. Space is a big place with big things but then there’s the magnetosphere, the moon, asteroid belt, gas giants, gravity, solar weather, the sun etc all conspiring to make this planet safe from outside intrusion (alien-free thanks to the light-speed limiting factor) and ergo much more likely to die of a burst aneurysm caused by straining while seated on a toilet than anything outside our atmosphere which funny enough is inside the sun’s as well. I’m hoping to see it. The fact that it can be seen on halloween day makes it so interesting. Wow! This is really scary. The object is an asteroid with an orbit that rarely crosses the ecliptic and with an orbit that keeps it usually beyond Mars. This orbit and it’s density suggest it may have been a comet (comets originate in the Oort Cloud, the edge of which Pluto hangs about. Ish. It is an asteroid now because it no longer … does anything a comet does and does all the things the asteroids in and around the asteroid belt that cinches the solar system’s rocky planets off from the has giants. Like any non-planetary object orbiting the sun, it can be considered a planetoid because of some strange sentiment in re Pluto and the invention of the term making every ball of metallic rocky icy dust whatever Pluto is called to keep people from the sorrow that is knowing Pluto is an asteroid in the aforementioned cloud. …Gun fact: Despite what we know from Star Wars, piloting a ship through any asteroid belt or cloud would be unlikely to involve seeing one. Though some of these objects are huge, space is unfathomably in its hugeness. Also, were one terribly dense (impossible — had they such gravity they would have joined in creating planets instead of being banished to etc etc all objects are exactly what they are for very well-understood reasons. Also, the asteroid has been imaged using radio waves, as it of course emits no light. Ergo amateur astronomers have snowballs chance of seeing it, considering it’s a pain to become and be kept aware of if one is an astronomer. Finally, if an object like this were going to collide with earth, one hopes reason would be a dictator and keep this fact from the general population. The general population, when made aware of such things, immediately goes into a state of panic that kills and harms more members of itself than any known event in human history save a few -demics, and arguably. As time goes bye,they are getting smaller and fewer.